The Dharma Hall, also called “Zhizhi Hall”, is the fourth hall of Lingyin Temple, located in the back of the Medicine Buddha Hall. Zhizhi Hall is the main place where Buddhist doctrines are expounded. “Zhizhi”, a Buddhist term of Zen Buddhism, means “straight to the heart”. The Dharma Hall of Lingyin Temple is named Zhizhi since it has been a famous place where the Buddhist rites have been performed through the ages. The name indicates that this hall is the Dharma Hall of Zen Buddhism. In the middle of the hall stands an exquisite platform made of Dongyang wood. There is a “lion seat” on it, which is the throne that masters sit on when they expound Buddhist sutras. When Master Xunyin was explaining Buddha Dharma, he said that the Dharma could destroy all evil spirits just as a lion roaring could make all the animals bow to its power. The seat was therefore named “lion seat”. On the back of the seat hangs a delicately-carved Wheel of Dharma, which is the main feature of the Dharma Hall. The so-called “Wheel of Dharma” refers to Buddha’s teaching of Dharma that can solve all troubles of human beings just as a huge wheel can crush down all the rocks and grits, and at the same time can be passed by to the next generation, not only to a single one person or at a single one place, like the wheels rotating. 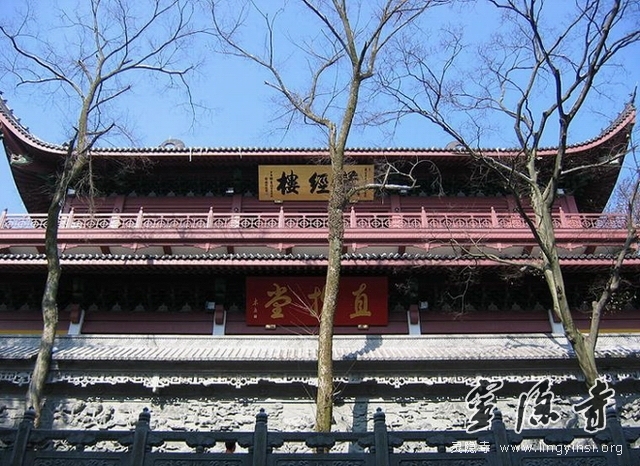 The present Dharma Hall was built by Monk Xuanli of Lingyin Temple in 1446.